Did Trump Unwittingly Rent Land to Gaddafi? Libyan leader Moammar Gaddafi may have decided to make the posh suburban town of Bedford his home away from home while at the United Nations General Assembly this week, pitching his Bedouin style tent down the road from Martha Stewart. Donald Trump may have inadvertently rented property in a ritzy New York suburb to loathed Libyan leader Muammar Gaddafi, who has spent weeks trying to find a place to pitch his trademark tent while in town for the United Nations General Assembly meeting. Doors all over the metropolitan area have been slammed in the face of the Libyan dictator, but Trump says he rented part of a large property he owns in Westchester County to a group of Middle Easterners who may be associated with Gaddafi. "We have business partners and associates all over the world. The property was leased on a short-term basis to Middle Eastern partners who may or may not have a relationship to Mr. Gaddafi. We are looking into the matter now," Trump Organization spokeswoman Rhonna Graff said in a statement. An ABC News helicopter filmed a large tent on the 113-acre Seven Springs estate, replete with rugs and patterned wall hangings. The Trump Organization owns the property, which straddles the adjacent towns of Bedford, New Castle and North Castle, and which is slated to be subdivided into multimillion-dollar homes. Local officials, law enforcement and the Secret Service confirmed that Gaddafi was renting property in Bedford, but did not know if the dictator, who is making his first visit to the United States since he seized power in 1969, was actually planning on staying in the town. Bedford town attorney Joel Sachs said a stop order was issued on erecting the tent just after 5 p.m., because it is illegal to build a temporary residence without a permit. He called the tent an "illegal structure." He said, however, that he was not picking on Gaddafi, just enforcing the law. It has been reported that Gaddafi might stay in Manhattan, near the United Nations at the home of the Libyan ambassador on 48th Street. Ahmed Gebreel, a spokesman for the Libyan mission said Monday, "It will be up to [Gaddafi] where he wants to stay. Nothing has been decided yet." Calls to the Libyan mission today for confirmation that the large brown tent seen at Seven Springs belonged to Gaddafi were not answered. "We deal with what's happening right now. Right now nothing is happening. There's no entourage, nothing. We're working with the Secret Service," Bedford Police Department Sgt. Tom Diebold told ABC News. "Other than calls from the press, we haven't heard anything from neighbors." Gaddafi has not found a warm welcome. His request to erect his tent in Manhattan's Central Park was turned down. Efforts to set up camp in Englewood, N.J., were also fought by the mayor until the Libyans abandoned efforts to win legal approval for the tent. The eccentric leader, who Ronald Reagan once branded the "mad dog" of the Middle East, arrived in the United States Tuesday but it was unclear if he was going to stay in Bedford. "A tent has been pitched," a source said, referring to the famous Bedouin tent Gaddafi usually stays in during foreign visits. On past trips he's pitched it in central Paris and in a park in Rome. State and federal politicians who learned that Gaddafi had rented property in the area were outraged that the Libyan, who has been linked to acts of state sponsored terror might sleep among their constituents, which include the likes of style queen Martha Stewart. "It's not confirmed that he is coming to Bedford. We only know he's rented some property. He's not going to have many fans in Bedford or Westchester County, certainly not me. Don't want to see him in my county or my district. There's not going to be any welcome mat for him in Bedford," Republican State Sen. Vincent L. Leibell said. U.S. Rep John Hall, D-N.Y., said he would contact the State Department and other federal authorities to protest Gaddafi's presence in his district. "This sponsor of terror is not welcome here," Hall said. "Several residents of this area were horrifically murdered on Pan Am Flight 103. Gaddafi's presence in our community is a slap in the face to the memories of these victims and their families, adding to the recent outrage of the hero's welcome Gaddafi staged for the convicted murderer released by Scotland." The Libyans have had a tough time finding housing for Gaddafi on short notice, since almost all hotel rooms in the area have been booked already. Gaddafi's quirks have made the search even harder. According to sources the eccentric Libyan leader, who is guarded by a cadre of all-female bodyguards, distrusts elevators and was looking for first floor accommodations. Sources said the Libyans were looking for a New York hotel ballroom where they might pitch the leader's tent. In August, Englewood residents protested the possibility of Gaddafi pitching a tent on property there owned by the Libyan embassy. The State Department stepped in over the summer, assuring residents that the colorful dictator would not be making camp in their town. Many of the Englewood residents were particularly incensed by the release of Abdelbaset al-Megrahi, a Libyan imprisoned in Scotland for the 1988 bombing of Pan AM Flight 103 over Lockerbie, Scotland, who was warmly welcomed home by Gaddafi last month. "Frankly speaking, I'm glad he won't be sleeping in my city limits," said Michael Wildes, mayor of Englewood and an immigration lawyer. "I can't understand why he won't be served an arrest warrant for the 38 citizens of New Jersey that died in the Lockerbie disaster. "It is my prayer that the State Department will issue a restrictive visa so he won't, under the cover of night, sneak into my town," Wildes said. When the tent plan got nixed, Gaddafi, Libya's sole leader since 1969, went looking for digs a little closer to the United Nations building on Manhattan's East side – but he didn't have much luck. Beginning around Labor Day, Libyan agents pretending to be members of the Dutch mission began haggling for a Manhattan townhouse, according to real estate broker Jason Haber of Prudential Douglas Eliman. But as the perspective renter's demands became increasingly ridiculous and they were unwilling to negotiate, Haber quickly realized with whom he was dealing. "I'm not a linguist, but it became pretty clear I wasn't dealing with the Dutch. They keep making more demands and asking for things we didn't have. They were always demanding something else and were always abrupt. From their e-mail addresses I realized I was dealing with the Libyans," Haber told ABC News. "They kept asking, 'What will be the price? What will be the price?' I knew Gaddafi was having trouble finding housing in New York City and I was through with dealing with them. Finally I just said, 'Well, if you send Megrahi back to Scotland, maybe we can work something out.' They hung up and that pretty much ended it," said Haber who has a degree in international studies from Columbia University. The Libyans won't officially comment on where Gaddafi plans on staying once he arrives in New York Tuesday. One rumor had him staying at The Pierre overlooking Central Park, but the hotel denied it. "[Gaddafi] is not and never planned to stay at The Pierre," said hotel spokeswoman Sheila Donnelly Theroux. When he arrived in New York in 2007 to address the General Assembly and students at Columbia University, Iran's Ahmadinejad, was met with protests. In 2007, he was considered a pariah who denied the Holocaust, called for the destruction of Israel and pursued an internationally condemned nuclear weapons program. When he arrives in the city today, the Iranian president will be an even greater outcast, and his reception in New York reflects his current standing worldwide. Following an allegedly botched and rigged presidential election in June, Ahmadinejad has suppressed protests at home, while renewing his rhetoric about the Holocaust and according to some, continuing efforts to develop nuclear weapons. The Iranian president, as it turns out, will stay near the U.N. at InterContinental The Barclay, a fact that the hotel is not exactly advertising. The accommodations for the Iranians were first revealed by the protest group United Against Nuclear Iran, and sources have confirmed the account to ABC News. But the hotel officials refuse to confirm or deny Ahmadinejad will be staying with them. "InterContinental Hotels & Resorts is fully committed to the safety, comfort and well-being of its guests and associates. In the interest of guest privacy, we are not at liberty to reveal or discuss the details of guests or groups staying at any of our properties. This is a hotel and brand policy," said spokeswoman Caroline Counihan. The UANI has been unable to get the InterContinental to give Ahmadinejad the boot, but several other New York hotels that were planning on allowing Ahmadinejad to hold dinners, abandoned the president after being targeted by the group. The Helmsley Hotel and catering hall Gotham Hall both cancelled receptions that Ahmadinejad planned on holding in New York. "As soon as Helmsley corporate management learned of the possibility of either the Iranian mission or President Ahmadinejad holding a function at the New York Helmsley Hotel, they immediately ordered the cancellation of that function," said Helmsley spokesman Howard Rubenstein in a statement. "Neither the Iranian mission nor President Ahmadinejad is welcome at any Helmsley facility. The Helmsley organization is grateful to United Against Nuclear Iran for bringing this matter to its attention so that appropriate action could be taken," he said. UANI on Monday wrote a letter to Essex House, another New York hotel, asking that it, too, cancel a reception Ahmadinejad is reportedly planning there. The Iranian mission would not comment on Ahmadinejad's plans while in New York. Both Gaddafi and Ahmadinejad can expect a particularly cool reception from Obama as well. At a recent press conference, Susan Rice, the U.S. ambassador to the U.N., said Obama had no plans to interact with either of the men. "With respect to the Iranian leader, I don't think there's much likelihood that there will be an interaction. There's no obvious venue in which that would occur, and certainly we have no meetings or anything of the sort planned," she said. "And with respect to Gaddafi, Libya holds a seat at present on the United Nations Security Council, and Libya will be present at the Security Council summit." 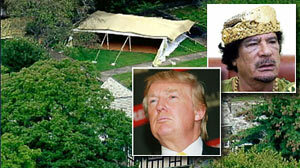 Did Donald Trump Unwittingly Rent Land to Gaddafi?